If you aren’t quite ready to start dressing with 33 items or less, or have hit a minimalist wardrobe road block, change course for bit. Try a simpler challenge to motivate and inspire a full commitment to Project 333. This mini-mission invites you to experience the benefits of a smaller wardrobe. To participate, choose 10 items and create a wardrobe based on the Goodwill 10 piece wardrobe formula. Focus on simple pieces that fit your body and your lifestyle. Stick with your 10 pieces for 14 days. You’ll create a uniform, and the core of your Project 333. Even if you’ve already started Project 333, see if this mini-mission will help you determine the most important pieces in your capsule wardrobe. Mini-missions are often one step actions that you can do to improve your health, relationships, bank account or wardrobe. They’ve become so important in my life and such a favorite on Be More with Less, that I invited a few of my friends to create new mini-missions, updated reader favorites and made a new ebook, mini-missions for simplicity. Q: Where can I buy the book? Q: I don’t have a Kindle so how can I read the book? A: Kindle books can also be read using the Free Kindle Reader App for your Web Browser, PC, Mac, iPad, iPhone, BlackBerry, or Android. Q: Is this book in print format? A: No. It’s a digital book. Q: How long is this book? A: The PDF version is 65 pages including 36 mini-missions. The best part about the book is that you can start anywhere by choosing a mini-mission that’s best for what you need right now. 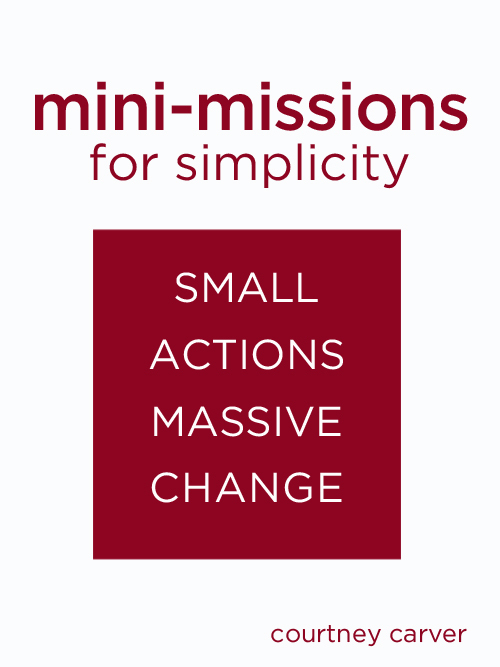 Mini-missions for Simplicity is now available on Amazon. When I discovered that my uniform is basically sleeveless woolen sheeths that I wear long sleved shirts under with tights .. and that with a black one, a grey one, a blue one, a fucia one and a green one, I can pair with set of rainbow tights, and mix and match long-sleeved Ts and pair with a broach .. I discovered that I already had a key to 333! I found the 333 book excellent and recommend it to anyone looking for a systematic approach to reducing wardrobe noise and falling in love with your clothes! If that seems like too much, I imagine that this is a great place to start! Thanks for the mini mission and the Goodwill 10 piece wardrobe formula. I am working on adding clothes to have 33 pieces for my work wardrobe and at the moment I have about 20! After looking at the 10 piece formula, I pulled my basic corresponding pieces out and took pictures. I now have my own 5 page, 56 outfit layout to use as reference. My uniform includes the JCrew City Fit pant in khaki with a black t-shirt or a French Navy t-shirt and black flats. I always feel just right. I also can never not have a black sleeveless dress in my closet.